Anyone knows how to fix them? Btw direct10 displays shadows incorrectly and in software mode looks horrible and the flashlight is glitched. I also have the lastest downloads for everything. how is the flashlight glitched when using software mode ? can you shoow us, please ? (10-30-2014, 08:05 AM)jesalvein Wrote: how is the flashlight glitched when using software mode ? you can give latest git version a try, but it don't think it has been fixed yet. 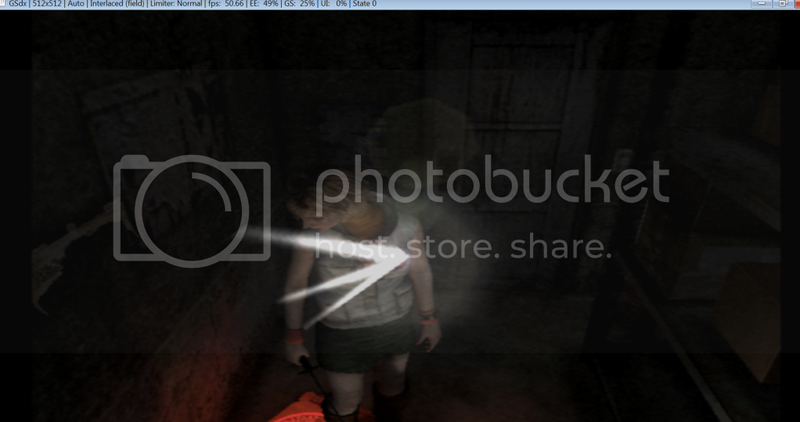 SH series always have been having that "flashlight" problem since the first time I used pcsx2 (0.9.4 version). Turn off any additional settings (like HW Hacks) and try using our widescreen hacks (link in sig). (10-30-2014, 08:58 AM)devina40 Wrote: Turn off any additional settings (like HW Hacks) and try using our widescreen hacks (link in sig). I dont have any hacks enabled, will try the widescreen hack but I dont see how it would fix my graphical problem. Btw Silent hill 2 runs perfectly without graphical bugs for me. Hmm yeah, shadows do seem messed up in SH3. (10-30-2014, 01:11 PM)xRyudo Wrote: Hmm yeah, shadows do seem messed up in SH3. Shadows have been this way for a long time. And the flashlight works fine in hardware mode for me, I don't get any white squares. If it helps, once you beat the game, you can unlock alternate costumes and when they're equipped, the white squares should go away. (10-30-2014, 01:38 PM)devina40 Wrote: Shadows have been this way for a long time. The white squares only happen when using directx9 hardware, the weird shadows only happen when using directx10 hardware the flashlight works fine in directx10, you can somewhat fix the shadows in directx10 hardware by setting skipdraw to 2 in the hacks but still buggy. BTW the lastest git version also has the same problems in Silent Hill 3, any way to inform the devs of this unresolved bugs?